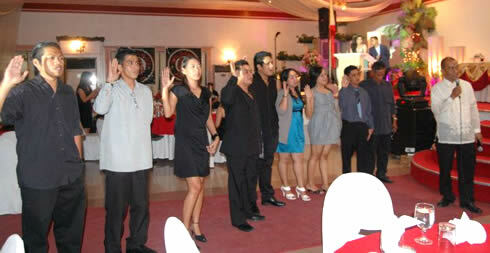 The oath-taking of the new set of Law Student Association officers with College of Law Dean-Atty. Eduardo F. Sanson (farthest right). College of Law (CLaw) of the Western Mindanao State University (WMSU) commemorates its 3oth anniversary today. With the theme, 30 years of Continued Commitment to Excellence and Service to Men Through the Legal Profession, the law school will launch a Testimonial Dinner in the evening at the Marcian Garden Convention in this city as the highlight of the event. CLaw Dean-Atty. Eduardo F. Sanson and members of the College of Law faculty, university officials, law students and graduates who recently passed the 2011 Bar Examinations will be in attendance to the said function. Atty. Jose I. Lorena, former Autonomous Region for Muslim Mindanao Attorney-General and alumnus of the college is the guest speaker for the event. Atty. Lorena belongs to the 1988 batch of graduates of the law school. On the other hand, the five successful 2011 WMSU bar examinees are expected to render their respective speeches during the night. This tradition has been in existence for years now, in which new lawyers inspire the other law students and bar hopefuls with their own contending experiences in law school, bar exam tips and other uplifting tales. In addition, the oath-taking of the new set of the Law Student Association officers is also slated during the event.